Prompt first aid can have an important influence on the eventual outcome of an injury. What you do, and how quickly, can have a dramatic impact on healing time and recovery. We all see the grim and startling images within the press of horse injuries, but would you know what to do in an emergency? 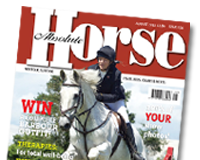 In this feature we look at being prepared whilst out hacking, away from home and how to successfully asses your horse should an accident occur.